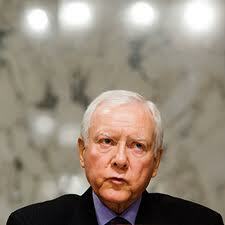 Orrin Grant Hatch is a Republican senator from Utah. Hatch served as the chairman or ranking member Senate Judiciary Committee (depending on whether the Republicans controlled the Senate) from 1993 to 2005. He previously served as chairman of the Health, Education, Labor and Pensions Committee from 1981 to 1987, and is expected to become the top Republican on the Finance Committee in the 112th United States Congress. Hatch also serves on the Board of Directors for the United States Holocaust Memorial Museum. Hatch was considered for a seat on the Supreme Court during Ronald Reagan's presidency, and his name was mentioned in the press during the George W. Bush administration as a possible replacement for either William H. Rehnquist or Sandra Day O'Connor. Although a conservative Republican, Hatch is noted for his willingness to cross party lines to get legislation passed. He notably formed a longstanding legislative partnership with the late Edward M. Kennedy, a liberal Democrat from Massachusetts.